A quick history of English hedges | Notes from the U.K. This entry was posted in History and tagged Cornish hedges, enclosure, Enclosure Movement, English hedges, hedgerows, heges by Ellen Hawley. Bookmark the permalink. Oh what a lovely survey of the History of hedges. Its a fascinating subject for landscape geeks. I had always assumed that many hedges had only been planted since enclosure which had happened on a mass scale since 1750s and was surprised that 2/3rd of English hedges were over a thousand years old. I think that most rural wall are “dry stone” walls. It takes skill but it’s probably a lot cheaper than using mortar. Gower still has a lot of common land and commoners still graze their cattle, horses, sheep on the land. I am particularly fascinated by the movement of the “free range” cattle in the Three Cliffs Bay area as they move from the top of the cliffs, down to the grassy river banks and sometimes love to just chew the cud on standing in the middle of the sandy beach. Only hedges round this part of Gower are around people’s gardens. I do remember realizing, when we visited the Gower, that the gates in front of people’s houses were to keep out the sheep and cattle. I loved it. and a splendid book by Roy Moxham available. I love the stuff I learn here. Thanks. As long as it’s modest. I’m going to have to start taking everything you say more literally, aren’t I? I didn’t think anyone but me knew about Moribundizia. This is–um. Frightening? Wonderful? Amazing? Hard to take seriously? It’s Afrazing. AND hard to take seriously. Damn, and here I thought I couldn’t read Latin. This brings to mind for me one thing, and one thing only: “We demand a sacrifice–we demand a SHRUBBERY! !” Great post! It puts that scene in a different context, doesn’t it? Not the Knights of Nee! This is probably a good time to admit that I haven’t memorized the dialogue. It’s probably also a good time to bow out and let the players who have continue without my input. Sorry, but my shrubbery stays at home. It doesn’t travel well. Then we shall say NEE to you a-GAIN!!!! Oh, it’s okay. Worse things have been said to me. Nee! Nee! Nee, nee, NEE!!! Well, look at that. You really are immune, aren’t you? Shhhh. That can get expensive. Yeah… You weren’t reconsidering the purchase of that Florida real estate I offered a post or two back…? I wasn’t, but I genuinely do appreciate the offer (she said as she backed out the door). Hey!… Hey, come back! I have a prime plot in Susquehannah, too! Damn. How’d you get lucky enough to own all this stuff, hey? Please send by the most ridiculously overpriced delivery method available, but definitely not c.o.d. There is a unique distinction between a Cornish Hedge and a dry stone wall. Where the dry stone wall is as it says, a wall made of a single course of stones without mortar. Usually seen in the northern counties of England. Gorgeous addition to the conversation, Bill, and thanks. I knew (she said defensively) about the two halves and the core of the Cornish hedge, and once knew (vaguely) but had forgotten about the sloping sides, but I hadn’t stopped to think that the dry stone walls I’ve seen up north really do look very different. And that, um, there’s probably a reason for that. I may go back and add your comment into the body of the post for the benefit of anyone who finds it later on, because it really does matter–at least to anyone who’s interested in the topic, as I clearly am. I got that into the late addition, so it’s now in the post. Thanks again. As some of my further-out-there friends like to say, “It was meant to be.” Or not, but I’m glad the timing worked so well. I’m happy, whatever the cause. This was terrific history, Ellen. Who knew hedges were far more than marking property lines, containing animals, and growing necessarily plants. Well, I guess those three are a pretty big deal. Still, this was a big eye and mind opener. Thank you! It’s nice to know that other people find the history as fascinating as I do. Phew! That is quite a history! Loved reading this! I had no idea. Thanks. I’m glad to share a bit of the love I have for this place and its messed-up history. 1. I didn’t know that hedges were used in the thirteenth century. In my head it was all strip farming. That’s definitely something to investigate. 2. Even as a child I noticed how small Cornish fields were compared to everywhere else. I’ve driven from Yorkshire to Hampshire today and all the fields I passed were huge. You could get ten or more Cornish fields into them. 3. I can’t tell the difference between blackberry varieties either, but I still remember the surprise of someone with whom I was on a walk forty years ago when I picked and ate blackberries as we were going along. I don’t know where he came from not to know that blackberries grew in hedgerows, but I grew up in a town and I knew. No, I have no idea why ‘hedgerow’ makes more sense to me in that context than ‘hedge’. 4. I have never before wondered why Cornish hedges are ‘different’. That’s probably because they’re part of my childhood. You’ve brought back all kinds of holiday memories, not least one of my younger sister walking along a Cornish hedge and falling into a patch of nettles. To this day I’m not sure why it was my fault. I picked the first wild blackberries today and–wouldn’t you know it?–stuck my hand into nettles. My fingers are stinging as I type. Somehow blackberries and nettles always seem to find each other. 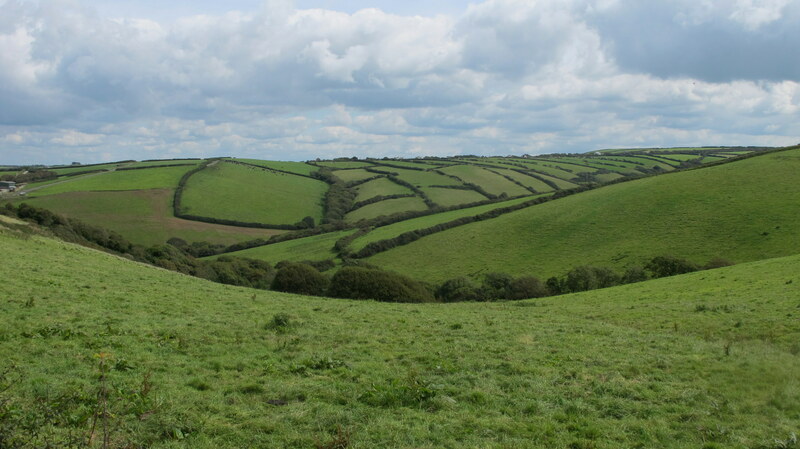 Near Boscastle, there’s a field called the Stitches where you can still see the outlines of the strip field system. If you ever get down this way, let me know and we’ll go be awestruck by it together. As I read up on hedges for this post, I began to think that hedgerows are the rural things we’re talking about and hedges are their suburban imitators. but I’m not sure I’m right about that. I hope your fingers are feeling better. I learnt quite young that, contrary to popular belief, rubbing dock leaves into the place where you were stung doesn’t work. Boscastle sounds interesting. I was last in Cornwall about fifteen years ago, so it’s about time I visited again. I have mixed feelings about dock. It doesn’t make the sting go away, but it seems to help a bit. Or maybe it’s just that it gives me something to think about other than how much my fingers/arms/whatevers are stinging. It may well be the placebo effect. If it works, I’m all for it. I was just reading a New Yorker article on pain research, and one element of the research is on how various states of being and thinking affect a person’s experience of pain. Everything from anxiety to stress to a history of chronic pain can make it worse. Assorted mental tricks can tone it down. So if rubbing dock on it (or patting my head three times) helps, why argue? I wouldn’t argue at all. Herbalists say that both dock and plantain have skin-softening, soothing, moisturizing properties. Mainly they help us rub irritants off the skin but they may do a little good…then again, the properties of herbs depend on their growing conditions. I’ve applied crushed dock to blisters, plantain to insect stings, and felt immediate relief. Then again, different plants of the same species, at different times, have had little or no effect. Now that’s interesting, and it fits with something a mushroom-hunter I once knew told me: that there are species that can be safe in one area but poisonous in another. She knew her mushrooms well enough to know what she could pick safely if she was out of her home area, which I found impressive. And frightening. Ellen, this is fascinating, and a post I’ll be referring back to from time to time. My first childhood home was surrounded by hedges, and so many years later when I bought a home, one of the first things I did was start planting hedges. Of course, they aren’t the intricate ecosystem hedges written about here, but … Must be my English genes! The English seem to value enclosed spaces. It’s rare to see the kind of bleakly open spaces that American suburbs (and spread out cities) are so prone to. The house we bought is part of a 1970s subdivision–what’s called an estate here–and the front lawn was bleakly open. We planted a hedge which is the world’s slowest growing hedge and I’ve taken to thinking of it as our imaginary hedge. But low as it is, it does soften the place. Minnesota? I lived there for 40 long winters (not to mention hot summers). It’s interesting to see something living that has spanned centuries, while humans tried to use them for different purposes. I didn’t really appreciate what the word “hedgerow” meant until I was riding next to one on one of those historically narrow roads. I can’t imagine trying to get through one. Thanks for the history lesson. I find this stuff fascinating. By some strange twist of fate I recently read a fascinating book about this very same topic: “Cræft : an inquiry into the origins and true meaning of traditional crafts” / Langlands, Alex. This dude, an archeologist, if I remember correctly, really digs in and tries to recreate things done in the long forgotten past. Or nearly so, he does find experts along the way who are still practicing the arts or crafts from back in the olden times. Fun read! Fantastic. Friends of mine who live in northern Minnesota, did something similar if less systematic, making deerhide mocassins and birchbark baskets based on paintings of traditional ones. A bustle in your hedgerow? I wonder if that’s the kind of bustle you can wear (if you’re inclined toward that kind of thing) or the kind of bustle as in hustle and…. Presumably the second, and she’s not going to come out looking her best. I managed not to catch those lyrics. But yes, a hedgerow is a handy thing to duck behind on a long walk when you’ve been drinking too much water. Or tea. Or beer. Or if you’ve met the love of your next twenty minutes and want the illusion of privacy. In Cornwall, they allow you to hide from half the county, but the other half has a good, if distant, view. Pingback: The Swing Rebellion | Notes from the U.K. Thank you so much for this post. It answered every question I had about hedges, and many more that I didn’t know I had. The concept of the hedge is a bit mysterious to Americans, at least to those of us who are aware that an English hedge is different from our simple long low bush. And now, at least for this American, the mystery is cleared up. Thank you! My pleasure. The fun of writing this blog (in addition to hearing that I’ve made someone laugh) is hearing that someone’s actually found it useful.